The Taunton Pilates studio was opened by Karen Pearce in 2000. After a career as a professional ballet dancer she trained and qualified to teach Pilates with Alan Herdman in London. Pilates is a complete exercise regime designed to promote good posture, flexibility and controlled breathing, whilst toning muscles to attain a leaner, firmer body. This is achieved through small subtle exercises which are non-aerobic and suitable for any age and ability. The idea of Pilates is to balance the muscles of the body – strengthening the weak and stretching those which are over used and tight. Once posture is improved and muscles of the pelvic girdle become stronger, back pain and related problems are then eliminated. The benefits of this technique are achieved far more quickly in a studio with specially designed machines using springs and ropes. The equipment we have in the studios includes Reformers, Trapeze Table, Core Align, Ladder Barrel and Combo Chair. There are literally hundreds of exercises that can be performed on the various pieces of equipment and all of these can then be adapted for individual abilities and conditions, ranging from post surgical rehabilitation to a programme tailored for professional sports players. Using the Pilates equipment not only adds interest and fun to the exercises but also, using the resistance and support of the springs, allows you to improve flexibility and balance, lengthen and strengthen muscles and achieve far greater results than just doing mat work exercises. 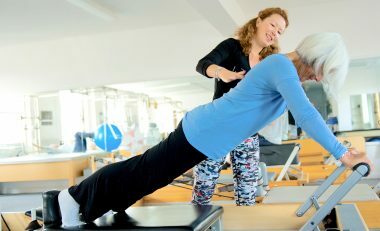 A Pilates Studio session generally lasts 75 minutes and individual tuition is provided in small groups,which allows each client to work at their own pace. Instructors are always in attendance to give as much help and guidance as needed. Pilates is the most enjoyable form of exercise that I have ever encountered! It is the best form of self-help that I know. With the expert guidance of the teachers, I’ve gained a greater understanding of how to stand, walk and breathe more effectively. Pilates should be compulsory! It’s just the best form of exercise I have ever done. I would recommend it to anyone. Working on my core strength has improved my posture and body shape. I always feel relaxed and calm after a session. Karen and her team are so enthusiastic and knowledgeable, they always have an exercise to sort out that problem. In 2003 I had the choice of spinal surgery with a 50/50 chance of success or to "try the Pilates Studio". I chose the latter. I was nervous of causing more damage and skeptical of achieving any improvement. Karen understood my medical condition, dealt quietly, calmly but firmly with my fears and knew when to push me to gain strength and flexibility. The result - I sleep without pain, walk the hills with no discomfort and carry my grandchildren with ease and confidence. Maintaining and improving my level of fitness has become a necessary but enjoyable way of life! Joining the Pilates Studio in Taunton was the best thing I did to get rid of my back pain. Although I’d gone the usual route of physiotherapy and hydrotherapy I had reached a plateau. At Karen’s Studio she used ongoing assessments to give me gentle, safe and corrective muscle-strengthening exercises. Gradually the pain became less and less and I was doing all the normal Pilates exercises. Today I’m definitely fitter and more flexible than my non-Pilates friends. And if niggles of pain return I know how to get rid of them. Karen and her trained team are really friendly, relaxed and caring of each client’s needs. The sessions are always enjoyable and I look forward to each one. I have attended The Pilates Studio in Taunton for 7 years. The teachers are professional and friendly and exercises are tailored to the needs of each individual. Pilates gives me the opportunity to help myself. I look forward to each session, and always feel happier and more positive after my workout. I feel extremely lucky to have Karen as my tutor. Not only for the wealth of knowledge and experience she has, but also because it’s combined with a genuine passion for this amazing discipline, which she demonstrates in a calm and effortlessly professional way. Recognizing each clients individual needs and ability making her instruction lucid and precise therefore easily followed. I absolutely love Pilates and it will always be part of my life. Pilates is like a series of building blocks! As you learn to identify muscles it become possible to work more effectively on them, and the intensity at which you work increases. Teachers relish the challenge of modifying exercises to suit the needs of each person. The Pilates Studio has a lovely atmosphere because the teachers are dedicated to making each person feel at ease. Everyone is given encouragement and instructions are carefully given which ensures success and gradual improvement. I don’t know anyone who doesn’t feel better after his or her workout!